Welcome to today's edition of Nerd Alert, where we have all the off-beat, nerdy news for you in one convenient spot. What do we have in store for you on this wondrous Wednesday? Game of Thrones gets its own version of the Risk board game, Iron Man gets an Honest Trailer and the emotions of Inside Out get mashed up with the mind-bending Inception. For those handy DIY types, we also show you how to build your own Terminator robotic arm. And Adidas has finally revealed their line of Marvel's The Avengers basketball sneakers. So, sit back, relax, and check out all that today's Nerd Alert has to offer. As Marvel Phase Two comes to a close next week with Ant-Man, Screen Junkies goes back to where the MCU first started with an honest trailer for 2008's Iron Man. 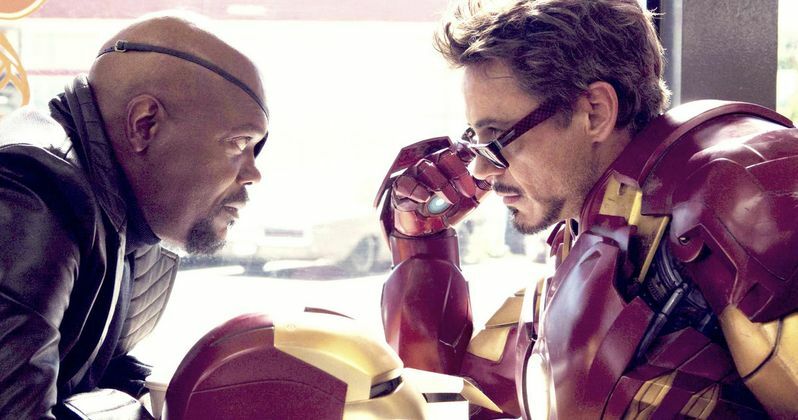 The three minute video skewers Marvel's tried-and-true formula, poking fun at how similar Robert Downey Jr. is to his Tony Stark character, and how all of Tony's weapons end up being used against him. For those who want to carry their love of Avengers: Age of Ultron onto the basketball court, Adidas has launched a new line of shoes, inspired by Thor, Iron Man, Captain America and Hulk. The shoes will cost $125 apiece, and you can buy the Thor shoes now at the Adidas website, while the Iron Man and Hulk shoes are available for pre-order. Corridor Digital has put together a hilarious video that pokes fun at Batman's tendencies to backhand criminals, in several different ways. It's rather inventive and humorous, with the Dark Knight literally naming each backhand as he battles a slew of baddies. Now that Pixar's Inside Out has finally overtaken Jurassic World at the box office, the time is right for a new mashup, with Nelson Carvajal taking the trailer for the animated hit and inserting the memorable Inception trailer music, Zack Hemsey's "Mind Heist." While the two drastically different movies don't always match up, it's largely effective and shows that practically any tone can be altered with the right music. Do you need a way to pass the time on Sunday nights, now that Game of Thrones is over? Then you're in luck because soon you'll be able to play a Game of Thrones version of the hit board game Risk, which will surely provide for hours upon hours of entertainment. The game set includes 650 pieces, two custom game boards, seven sculpted armies, seven player boards and 28 character cards, along with three different ways to play, depending on how many players you have. The War of Five Kings game in Westeros for 3-5 players that features the Houses Martell, Stark, Baratheon, Lannister and Tyrell, while a 2-player game allows you to contest the rule of Ghiscari slavers in Essos, featuring Houses Targaryen and Ghiscari, and you can also combine the two maps of Westeros and Essos with seven players that allows one to combat all seven Houses. The game will be available in August, at a retail price of $74.95. With Terminator Genisys currently playing in theaters, Awe Me's Low Budget Prop Shop series shows you how to make your very own T-800 robot arm, on the cheap. Spending only $30, host Dustin McLean breaks down how to build a rather convincing T-800 replica arm, using wood, plastic and items you can find at any local hardware store, including some silver spray paint. Casper Christensen of Filmnørdens Hjørne has put together a fascinating five-minute video comprised of his favorite opening shots of all time. The video includes classics like Taxi Driver, Apocalypse Now and Star Wars: Episode IV - A New Hope, along with modern films like Tron: Legacy, Casino Royale and The Dark Knight. Regardless of the era, an epic opening shot sets the tone for a memorable cinematic experience. Last month, we reported the sad news that legendary composer James Horner passed away at the age of 62. Cinefix used their popular 8-Bit Cinema series to pay tribute to the musical legend, recreating some of his classic themes from Glory, Braveheart, Titanic and An American Tail.